As the weather has finally warmed up here in our neck of the woods, I have been able to get some work done outside. Awesome, but I am reminded of cosmic laws. It seems that any time my hands become coated with grease or oil, my nose will begin to itch and I have have to pee. Another cosmic law. We got new carpet installed in our TV room. Occasionally, Kyle gets to eat in there while he watches his cartoons. The chances of an open-faced jelly sandwich landing face down on a floor is directly correlated to the newness of the carpet. Mrs. Shife and I got a sitter for the first time since Hayden was born. It was nice to get out of the house and spend a few hours together without the germ farmers. We went and saw "Rock of Ages." It isn't the best movie but it was fun because we got to relive some of our much younger days thanks to the music from the film. Lots of great memories goes along with those songs. I hurt my leg playing indoor soccer about 7 months ago, and despite physical therapy along with lots of rest, the leg just does not feel right. My doctor found nothing out of the ordinary when I saw him so I decided to try out a chiropractor. I am one of those people that is a little skeptical of the chiropractic way but so far my leg has felt a lot better. I am hoping being out of alignment is the reason for my leg pain and a few adjustments will have me feeling more normal. Been watching a lot of Euro 2012. Really, really enjoy watching good soccer. It has totally passed baseball as one of my favorite sports to watch. I have a new boyfriend and his name is Craig Ferguson. I enjoyed his work on "The Drew Carey Show" and just happened to catch his late night show recently. Well I am glad I did because he makes me laugh out loud. Little Miss Hayden just turned 7-months-old and if I had to guess, I would say she will officially be a crawler by the time I update this blog next week. She is just a little bundle of energy right now trying to move as fast as she can in every single direction. I am not sure how much big brother is going to like it when she is able to get into his toys. I want to thank each and every one of you who come by and visit my blog. Without you, I would not be doing this. You have been there for some of my proudest moments and unfortunately some of my darkest days. Your words have given me hope and the strength to keep fighting the good fight, and lifted me up when I needed it. Hopefully one day I will be able to meet some of you in person to tell you how much I appreciate you being apart of my world. “He is a wise man who does not grieve for the things which he has not, but rejoices for those which he has.” — Epictetus. Well that is about it for now. Whatever you do, make it great. Have a good weekend. We're finally getting some nice weather too, the garden is finaly starting to grow. I love Craig F. We've only seen a few shows of his and enjoyed him on Drew Carey too. Me and my extremely handsome son George are watching the Euro's too. England don't have a chance. The newspapers are hyping Wayne Rooney. I think he is rubbish. Do you support any English premier teams? If not, have a look at Everton FC. A great club. I like to be negative about the English team. It spurs them on. That's the theory anyway. Don't mention the weather to me. It is soooo depressing here in the UK. I swear by my chiropractor. Well, not exactly 'swear', that's not nice when someone is being so helpful, I should say he rates as being a miracle worker. Hope yours is as good. Great news that Hayden is itching to get on her feet... trust a female, eh? Now about this idea of meeting up... I could catch the next plane..... lol. 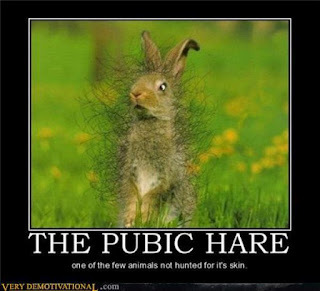 Pubic Hare!!!! that's damn funny. Hello, Mr. Shife! It's nice to hear your voice and I'm glad that things seem relatively well in Shife-World. I sure do hope that chiropractor helps. I think they can do amazing things. Good to know things are going well, except for the leg. When you coming out for that Cubs game, dood? I think you would be able to tell I love outdoor work. But as soon as I read the "nice weather" sentence this morning, it starts raining outside. I appreciate you stopping by my blog as well; you're one of the few that actually comments when they stop by. HA! 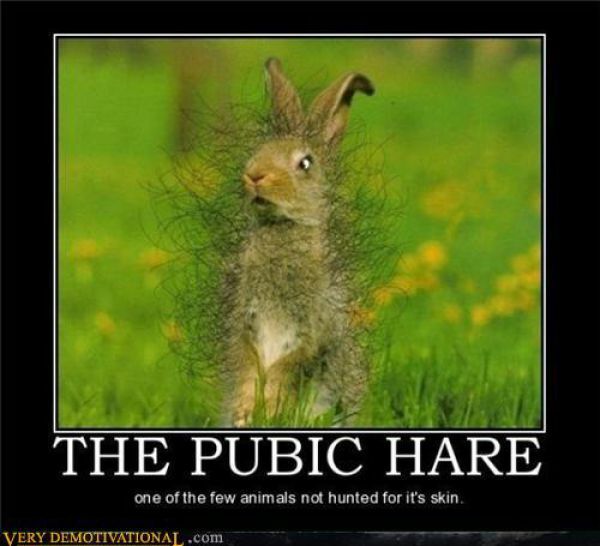 I love the Pubic Hare. Oooh... leg pain. No fun. Glad the chiro is helping. Whatever works. I am a long time fan of Craig F. He makes me laugh out loud too. I am stuck in weed world, pulling them out by the hand-fulls. I too am plagued by that need to brush a hair out of my face or my eye itches. Fortunately I was rained out today. However, that means that its icky here. Blah! I'm not up late enough to watch Craig Ferguson, but when I do catch him, I laugh out loud too. Can't believe your little girl is 7 months already. Geez. Ferguson voiced Lord MacIntosh in Brave. His BFF (besides you) is Shirley Manson. That is all. You and I have the same boyfriend. I love him too!